THE MOST AWESOME SIMULATOR FOR LEARNING ELECTRONICS! 100% money back guarantee for 30 days, You may cancel your membership at any time. Explain the basic electricity relationships. 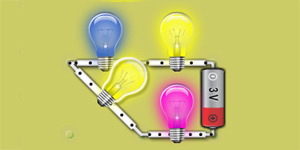 Create circuits out of schematic drawings. Make use of a voltmeter and ammeter to take circuit readings. Provide a logical explanation of the measurements as well as the circuit relationships. 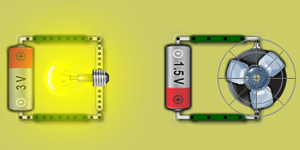 Explain basic electricity relationships both in parallel and series circuits. Develop a theory for explaining the circuit measurements. 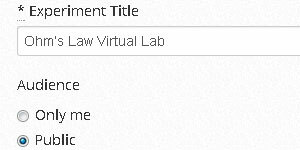 Find the resistance of different objects using the virtual lab. Discuss the charging and discharging processes of a capacitor in a circuit. Explain how an inductor behaves in a circuit. This handy oscilloscope can measure voltage by using realistic leads! The oscilloscope can measure current also. Students can easily observe the different settings of time base or volts/div that is found in the real oscilloscope. The oscilloscope has multiple functionalities, it can show voltage, ampere and root mean square (RMS). RMS voltage is the most common way to calculate the voltage of an AC circuit. DCAClab calculates RMS by sampling the input voltage and doing the sum-of-the-squares, simulating the high quality voltmeters, both AC meter and oscilloscope has RMS, the oscilloscope plots a dashed line to indicate the RMS. Experiment with multiple oscilloscopes simultaneously. 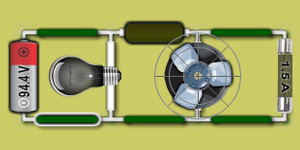 Students can easily observe the current flow animation on both conventional and electron flow. Set resistance using color bands Tolerance is randomly generated according to the selected color of band D Students can change colors of resistor and see the simulation in real time. Colorful lamps, student can choose from different colors to set lamps colors, making learning activity fun! You can set your created electronics circuits to be viewable, sharable, tweetable with all the world, we host them for you! Current flow can be seen as animated dots through wires& components. 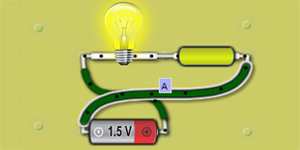 Student can simulate multiple circuits at the same time, and compare the simulation results. Realistic simulation for fuse burning depending on circuit parameters. Teacher or student can save his lessons into slides to organize teaching material.